Armed with the number one pick in the 2015 NFL draft and a veteran in Josh McCown, speculation continues to grow that Tampa QB Mike Glennon could be dangled as trade bait this offseason. That according to the Tampa Bay Tribune, which cites the Cleveland Browns as a potential suitor for Glennon. The report suggests that it would take all of a third or fourth-round pick to secure Glennon, as the Bucs are likely to take one of the top two quarterbacks in the draft this spring with the first overall pick. Glennon was part of trade rumors last year, with GM Jason Licht admitting he spoke to some teams about a possible trade including Arizona. With the Browns top two QBs from last year’s squad a free agent to be (Hoyer) and in rehab (Manziel), Cleveland may choose to pull off a deal. The Browns hold the 12th and 19th picks in round one this spring, and there is some speculation they may try to move up to number one to take a QB as another course of action. It’s Super Bowl weekend, but there’s plenty to talk about concerning the Bills. Here are your latest set of questions from email at AskChris@bills.nfl.net and on Twitter @ChrisBrownBills. The recent public comments of Brandon Spikes and Doug Whaley regarding his future in Buffalo as a upcoming pending free agent did not provide me with much confidence that he will return. Ultimately money and potential playing time will dictate the outcome and with the return of Alonso and big contracts to be spent elsewhere it doesn’t look particularly promising that he will be back in my opinion. I think a strong argument can be made for re-signing Spikes. He provides attitude, toughness and leadership to the position and helped to significantly improve the team’s run defense this year. He seemed sincere when he recently commented about enjoying playing in Buffalo and gives the impression that he loves playing the game. Sounds exactly like the kind of player we need to retain. Just wondering what your thoughts are of whether you think there could be a role for Spikes next year with the return of Alonso and if you think the Bills will submit a serious bid to retain Spikes or instead look for the cheaper option of adding depth players behind the projected starters? CB: It’s hard to say what Buffalo’s plans are concerning Spikes. Alonso’s return is a factor, but I think at the right price Spikes could return to the fold, possibly on another one-year deal. I do remember during a conference call this past season that Rex Ryan who was coaching the Jets at the time said the following about Spikes. Whether Ryan’s opinion of Spikes has any influence remains to be seen, but it would appear that Spikes has an admirer in Buffalo’s new head coach. Thanks for all the great coverage you continue to provide. I was wondering what you think the best approach would be in addressing the quarterback postion. Also, do you see Mike Glennon as a fit? I know the Bills were rumored to have liked him coming out of the 2013 draft, and I like much of what I’ve seen from him so far in Tampa. He should be expendable as the Bucs are expected to take a QB #1 overall. What’s your take on Glennon’s potential? CB: Glennon I felt took a bit of a step back in his second season, which was impacted by a new offense and coordinator. He was also in and out of the lineup with veteran Josh McCown earning the starting job out of training camp. Much like EJ Manuel he is limited with his number of starts after getting only six this past season (19 in his career). His completion percentage is comparable to Manuel’s (under 60) and he struggled when blitzed this past year. There’s no doubting that his arm strength would be an asset in the conditions the Bills play in at home, but his mobility is limited. Knowing his skill set is dramatically different to that of EJ Manuel (see: mobility), it’s hard to know if that would be viewed as a negative or a positive or irrelevant by the new staff. I don’t know if Glennon is seen as a match, but it wouldn’t surprise me if the Bills add a young QB in the league or a veteran signal caller either via free agency or a trade. What do you think the Bills plan of attack for fixing the O-Line? Richardson stills seems developmental and is poor at pass blocking. Pears should be let go and Urbik is average guard. With Williams injured and unclear if he will come back, how many guards do you expect them to bring in? Free agency or draft? It may hard to find a day 1 starter in draft but they need new guys in there. CB: I wouldn’t be surprised to see the Bills draft a guard and add one in free agency. Buffalo has some young guys already in the fold as you mentioned, but both Doug Whaley and Rex Ryan made it clear they’re going to bring in competition at positions where it’s warranted. Erik Pears is an unrestricted free agent. Kraig Urbik is a capable player. Chris Williams should be back healthy in time for spring workouts. One big plus is the hiring of Aaron Kromer, who has produced at least one Pro Bowl lineman on the teams he has coached the last six years. He’s a proven teacher and developer of linemen, so hopefully the younger players on the roster will take a big step forward in their development and be bigger contributors (See: Henderson, Kouandjio, Richardson). On a lighter subject, do you think the Bills would consider going back to their Red helmets? Best years in franchise history were with the Blue uniforms and red helmets. CB: I would not anticipate that happening. Outside of a throwback type of thing I think you’ll see the white helmets for a long time. I have really enjoyed the information I have received from your Inside the Bills write ups. Thanks for keeping us informed. Recently, I read and article on NFL.com, in which Mario Williams was excited about moving to the Linebacker position. To date, that information has not shown up on the buffalbills.com website. I have always believe the 4 3 defense was the best scheme, and our personnel matches that scheme. As our defense was one of the top defenses in the league, I am not clear if Rex and company intend to shift to a 3 4 defense. My thoughts are why? Then there is the statement, ” You don’t fix what is broken”. Can you shed some light on what is going on with the Buffalo Bills defensive scheme for 2015? CB: I think I will let defensive coordinator Dennis Thurman handle this one. He was asked this week if he’s going to run a 3-4 or a 4-3 front. Here was his answer. I don’t think there’s any debating that Rex Ryan’s defense are largely a hybrid scheme that can morph and change. So to label it a strict over or under front would be inaccurate. And I think Mario Williams will see a healthy amount of action up on the line of scrimmage. With the 2015 draft class widely considered to be a down year for quarterbacks, the trade market this offseason could be a route taken by some teams looking for bona fide quarterback competition. That could be what the Bills decide to do. ESPN’s Adam Caplan assessed the QB trade market knowing that Mike Glennon and Kirk Cousins are two likely trade pieces for Tampa Bay and Washington this offseason. Here’s what he thought both players would command in a trade. Multiple execs mentioned to me during Senior Bowl week that Kirk Cousins and Mike Glennon could be at least a one-year solution as a starter for teams struggling to find competition at the position. Cousins enters the final season of his contract in Washington and Glennon enters his third season in Tampa Bay. One NFC team exec said he thought both players would yield a fourth- or fifth-round pick in a swap. Buffalo has a pair of fifth-round draft choices in the 2015 draft. 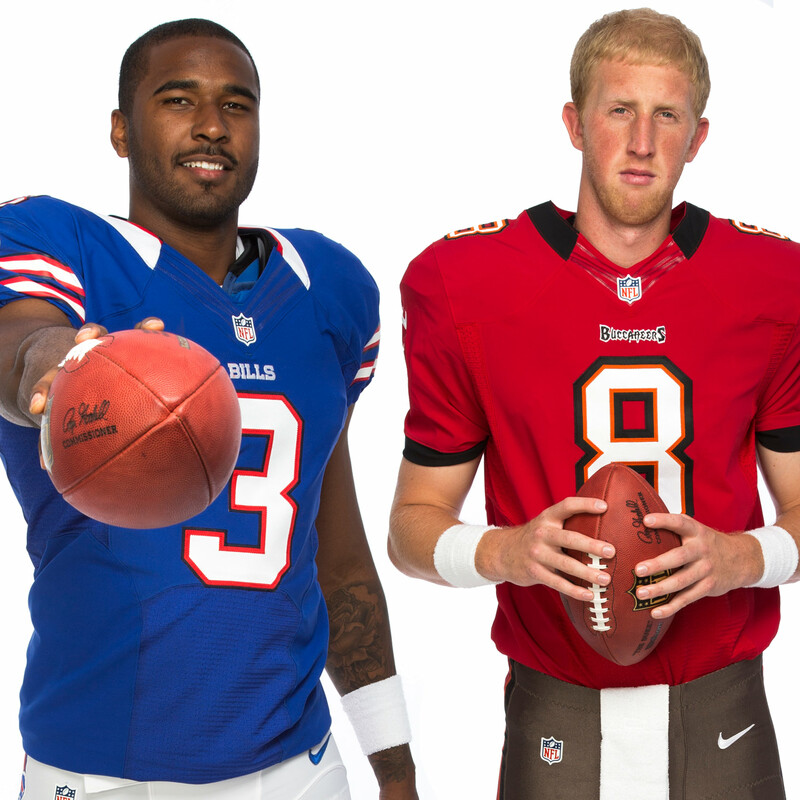 EJ Manuel and Mike Glennon will face each other head to head for the third time since the two were college quarterbacks. With Manuel and Glennon both playing their college ball in the ACC conference at Florida State and N.C. State, the two quarterbacks faced each other twice. Here were the results. The first meeting came in 2011 when both of them were juniors. Manuel’s Seminoles won going away 34-0. Manuel had a solid game going 25-34 passing (73.5%) for 321 yards and two touchdowns (20, 26 yards) with one interception and a passer rating of 166.4. Glennon was 19-34 (56%) for 130 yards with a pair of INTs in the loss. Glennon and N.C. State would get their revenge the following season when both he and Manuel were seniors. The Wolfpack upset the third-ranked Seminoles in an unlikely comeback effort. Trailing 16-3 in the fourth quarter, Glennon led a pair of touchdown drives to complete the upset in a 17-16 victory. Glennon went 30 for 55 passing for 259 yards with the two aforementioned TDs with one INT in the win. Manuel was 17-29 passing for 218 yards with a touchdown and an interception. So the record is even at 1-1 in head to head matchups between the two QBs. We’ll see how things begin in the NFL ranks today. EJ Manuel and Bucs QB Mike Glennon have each gone through their share of struggles in their rookie seasons. Some of their production numbers are strikingly similar, but there is one particular area where Manuel has a leg up. When facing the blitz Manuel has been very proficient. He’s a large reason why the Bills passer rating against the blitz ranks fourth in the league with a mark of 104.97. Glennon meanwhile is largely responsible for the Bucs passer rating against the blitz of just 78.7, good for just 23rd in the NFL. Buffalo’s approach toward Glennon, knowing he’s not the most mobile quarterback figures to be an aggressive one. We’ll see if he can improve on the blitz passer rating he’s compiled to this point against the league’s number one sack team. Both EJ Manuel and Bucs QB Mike Glennon have had some growing pains in their rookie seasons, but if there’s one thing they’ve succeeded at it’s keeping turnovers to a minimum. Glennon has just five interceptions on 290 attempts, while Manuel has four interceptions on 249 attempts. That’s good for an interception percentage of less than two percent for each of them. That puts both in the top 10 in the league among QBs. Here’s a look at some of the veteran QB company Manuel and Glennon are keeping right now with their interception percentage so low. As the Bills continue their search for a quarterback, there are more reports of pre-draft visits to One Bills Drive by some of the top prospects in the draft. Earlier, Rapoport reported that the Bills will host Oklahoma QB Landry Jones at One Bills Drive this week. The Bills announced yesterday at FSU QB E.J. Manuel was visiting the team complex. The team has also conducted a number of private workouts off-site with some of the top QB prospects. The Bills have had a few private workouts with some quarterback prospects the past few days. The Arizona Cardinals, who pick one spot ahead of the Bills in round one also have their eyes on some signal callers in the draft. According to ESPN’s Adam Schefter the Cardinals have a private workout scheduled with N.C. State QB Mike Glennon today. Cardinals GM Steve Keim and Arizona asst. 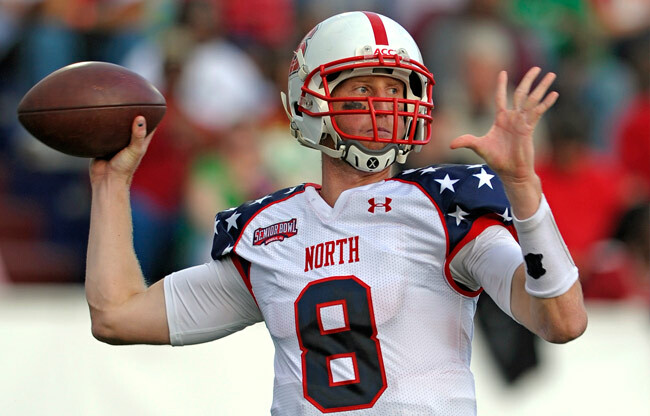 coach Tom Moore are in Raleigh, N.C., to workout North Carolina State QB Mike Glennon on Tuesday. Glennon is the type of quarterback that would fit Cardinals head coach Bruce Arians scheme. Arians has always preferred big-armed quarterbacks. Here’s a rundown of the quarterbacks with whom Arians has worked over the years, all of whom possess big arms. Glennon has been projected as a second-round pick. Despite the popular contention that there isn’t a quarterback talent in this year’s draft fit for the Bills pick at eight, another draft prognosticator has Buffalo taking one in round one. NFL.com’s Bucky Brooks has the Bills taking N.C. State QB Mike Glennon with the eighth overall pick. Here’s what he wrote. The Bills could elect to take a wide receiver or inside linebacker, but nabbing a franchise-caliber quarterback is GM Buddy Nix’s priority in this draft. Although Glennon is a limited athlete prone to making mistakes under duress, he is an A-plus arm talent with tremendous potential. Brooks has Geno Smith of West Virginia as the only other quarterback coming off the board in the first round. He has Smith going first overall to Kansas City. Bills WR T.J. Graham decided he wanted to go to college wherever Mike Glennon was headed after the two became fast friends at various summer football camps throughout high school. In a recent appearance on the John Murphy Show, Graham relayed a story about what completely had him sold on Glennon as his quarterback. “Mike Glennon is the reason I went to N.C. State,” said Graham. “I knew him from 2007 and camps and stuff and I remember telling him I was going wherever he was going. That relationship started because of an overthrown ball. “In high school I had a problem where nobody could throw me the ball. My junior year in high school I actually played quarterback because no one could throw the ball deep enough to get the ball to me. So what was the point of me being out there? So I decided to throw the ball to them. Glennon has been forecast as a late first or early second-round pick. Much has been made about the fact that there isn’t a lead pipe lock at the quarterback position in this year’s draft class, but NFL Network draft analyst Mike Mayock made a good point on a team’s confidence in developing quarterbacks. On a national conference call Mayock was asked about both Andy Dalton and Colin Kaepernick, who both were second-round draft choices. Both have become solid starting quarterbacks even though they were not finished products or can’t miss franchise signal callers when they came out. “They both became second round picks, they might have gone back‑to‑back in the draft, but what did people miss,” Mayock asked rhetorically. “Kaepernick, when he started taking off, I went back to my college notes on him, and I was like, ‘Look at all this I have written on this kid.’ What I had was big arm, wildly inconsistent, great athlete. Well you could see all that stuff. “But I think Jim Harbaugh and the 49ers spent a year kind of getting that arm where it was a lot more consistent. Could you say the same thing about Geno Smith? Probably. Could you say the same thing about Mike Glennon? Yeah, big arm. “I’m not talking about athletic ability with Glennon, but somebody could buy into a Geno Smith up high because they feel like there are flashes of everything there. However, he’s got to put it together on a more consistent basis. Knowing Bills offensive coordinator Nathaniel Hackett, who also is the team’s quarterbacks coach, was very successful in developing Syracuse QB Ryan Nassib, one wonders if the Bills have a similar faith to that of the 49ers in developing quarterback prospects that might not be finished NFL products at the time they are drafted. Hey Bills fans, NFL Combine week is coming up and we’ll have wall to wall coverage on Buffalobills.com with daily video reports, video interviews with prospects and members of the Bills front office. We’ll also have the John Murphy Show live in Indianapolis on Wednesday and Friday night from 7-9 pm with the podcast on Thursday evening. And of course plenty of written content for your to peruse through the course of the week. Keep it here all next week with our coverage of the Combine on site beginning on Thurs. Feb. 21st. Now to your questions from AskChris@bills.nfl.net and on Twitter @ChrisBrownBills. Q: With the new coaching staff taking over how much of an impact will Coach Pettine and some of his former Defensive Jet Assistants have on providing (Coach Marrone) insight on the Bills current Offensive Talent since they had to prepare for the Bills two times a year? CB: I think there’s some validity to that point, but I think coach Pettine or any other Bills defensive coach will only provide input on a Bills offensive player if it’s asked of them. Generally the coaches stick to evaluating their side of the ball, but are certainly open to offering opinions if they’re asked of them. I think this could be one of those unique circumstances where Pettine, Jim O’Neil and Anthony Weaver could have something to offer the offensive staff on their players. I am a statistic guy by nature. I was very surprised that George Wilson was the 2nd leading tackler on the team. He did it very quietly. What I did notice is that he didn’t have the big plays from years past. In fact neither he nor Searcy had any interceptions. The only linebacker with any interceptions was Bryan Scott. Tackles by linebackers were mostly by Nick Barnett.. Sheppard seemed to get lost on most run plays. He and Moats early in the year couldn’t fight off the blockers. A middle linebacker should be leading the team in tackles. Like Poz did while he was here. Sheppard should have 30-35 more tackles for the year. Moats seemed one dimensional, in that he could rush the passer. That was Aaron Maybin’s downfall. Nigel Bradham was making plays and hustling on every down. He can only get better. Where do you see Buffalo drafting a linebacker this year? Will it be middle or outside? CB: I think tackle statistics can be misleading at times. Often it’s where on the field the tackles are made rather than how many of them one makes. It’s kind of a moot point now regarding Wilson and Barnett now that both of them are no longer here. As for where Buffalo could address the linebacker position, I believe it’s wide open. I think they could go inside or outside. In fact I wouldn’t be surprised if they drafted one at each spot. There is some premier talent at the top that would be worthy of the eighth pick like Georgia’s Alec Ogletree, who I like a lot because of his versatility and elite athleticism. He was a safety that became a linebacker and made it work. I know that makes some fans skittish sometimes to see that. Ogletree is athletic enough to play OLB or ILB. He lined up inside for Georgia. Oregona’s Dion Jordan is another athletic anomaly that could go that high, though he’s coming off an injury. I like LSU’s Kevin Minter who is a late first, early second ILB. Alabama’s Nico Johnson is another ILB option in the third round. On the outside, Arthur Brown from Kansas State and Khaseem Greene from Rutgers are good day two picks though they might be on the short side for a 3-4 scheme at 6’1”. Southern Miss’ Jamie Collins and UCONN’s Trevardo Williams are two other OLBs that could figure in the third round. Who would you like to see the Bills get at QB, Glennon is getting all the hype, but Nassib is a Marrone guy. CB: You’re right that Nassib played for Marrone and offensive coordinator Nathaniel Hackett for that matter. What needs to be kept in mind is they know all they need to know about Nassib. Now they have to determine where he fits in the entire class of QBs. If there are prospects that they rank considerably higher than him and they have the opportunity to take the higher rated prospect that’s what they’ll be compelled to do. If the difference is marginal they might lean in favor of Nassib. 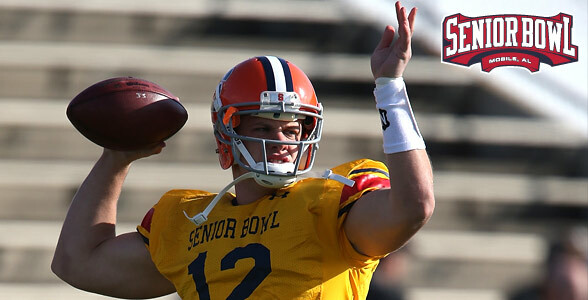 With the quarterback class a bit muddled with no consensus top talents I think it helps Nassib’s chances of being considered among the top signal callers. I’m still trying to watch more tape of these guys and I’ll admit it’s hard to like one considerably more than the other with what I’ve seen so far. It’s not nearly as easy as it was last year. Is Marquise Goodwin a possible target for a WR spot in the draft? He’s an elite athlete who competed in the 2012 Olympics and was the big play threat in the Texas offense. He’s also a value as a kick returner. Also, would his teammate Alex Okafor be a target if he’s there in the second? Is Buffalo still looking to upgrade the end position? CB: I don’t know that Goodwin, who projects as a third round pick is a guy that fits the profile of what Buffalo is looking for at the receiver position. At 5’9” and 179 pounds he’s not a fit to play outside and beat physical corners for jump balls and such. The Bills already have this kind of receiver in T.J. Graham. So I do not see him as a mark for the Bills. As for Okafor he’s an interesting prospect and did well at the Senior Bowl. The problem I see there is he’s considered a DE only and my suspicion is the Bills are going to be looking for defensive ends that can also line up as OLBs to allow Mike Pettine to be multiple with his scheme. Okafor doesn’t have the athleticism to run and cover as an OLB in a 3-4 or a 4-3. He’s strictly an up on the line end in a 4-3 by most accounts, so I don’t know that he works for Buffalo either. Thank You for keeping us updated each week, my question is with Leodis McKelvins contract being up and Aaron Williams still developing and not known, is there a chance we could go after FA Aqib Talib? CB: I don’t see the Bills pursuing Aqib Talib. He just doesn’t fit the character mold for a player that the personnel department looks for. He’s had some run-ins off the field and twice had fights with teammates in Tampa Bay. So while talented I don’t see him as a target for Buffalo. SI.com’s Don Banks has put together his initial mock draft for 2013, and not surprisingly he has a quarterback going to the Bills with the eighth overall selection. Banks chose to give the Bills N.C. State QB Mike Glennon. Here’s what he wrote about the pick. This pick doesn’t reflect where Glennon’s stock stands today, but where I think it’s headed. Granted, Buffalo’s need at quarterback is driving this projection of Glennon cracking the top 10. If the Bills don’t find him intriguing, he very well may not make the first round. New Bills head coach Doug Marrone probably loves his collegiate QB, Syracuse’s Ryan Nassib, but he’s more likely to earn a second-to-mid-round grade. Just got a hunch that Glennon’s size and arm strength will grow on NFL personnel men as the draft approaches. Banks did have two other quarterbacks coming off the board before Glennon. He had West Virginia’s Geno Smith going to the Eagles with the fourth overall pick and USC’s Matt Barkley to the Cardinals with the pick right in front of Buffalo at seven. Depending on what Browns new head coach Rob Chudzinski thinks of his current QB Brandon Weeden may also make Cleveland another team that could disrupt Buffalo’s likelihood of taking a quarterback in round one. Just days after ESPN NFL draft analyst Mel Kiper chose not to put a single quarterback in his initial first-round mock draft, NFL Network draft analyst Mike Mayock had a much different opinion. Mayock during NFL Network’s Senior Bowl coverage said he expects as many as four signal callers to come off the board in round one come last April. Mayock made reference to four of the QBs participating at the Senior Bowl this week, including N.C. State’s Mike Glennon and Syracuse’s Ryan Nassib.